The hull and top deck are constructed using a sandwich of foam core,vacuum bagged between layers of stitched multiaxial glass using epoxy resins. Materials used are Lloyds approved. 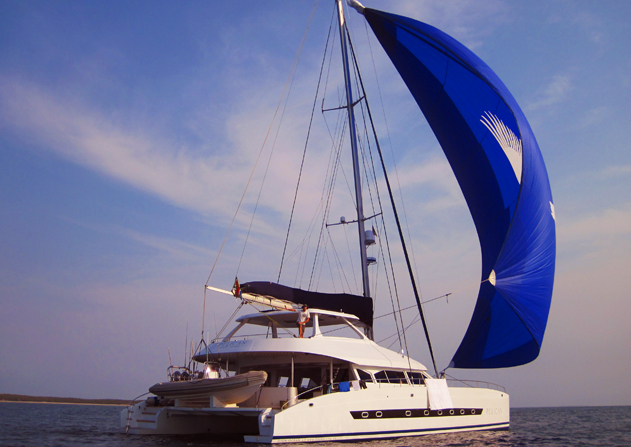 The catamaran hull provides excellent stability, and accommodation space, that is equivalent to that found only on far larger monohull vessels. The high bridge deck clearance ensures a quiet and comfortable ride during extended passages, particularly during inclement weather. The air-conditioned saloon on the main deck, incorporates the galley, which includes fridges,freezers, cooking appliances,dish-washer, saloon table/drinks cupboard, wine rack, the navigation station and lounge seating. Good ventilation and unobstructed visibility in the saloon, is achieved through opening marine hatches and toughened glass. The hulls are configured to individually accommodate two air-conditioned private, en-suite, double cabins. Each cabin has its own access to the saloon via an independent companionway. The forward section of each hull houses private en suite crew quarters. The port hull also houses the washing machine and tumble drier. The aft deck cockpit is spacious, offering direct access to the saloon.The coach roof extension provides overhead protection from the rain with the option of total weather protection in the event of the side canopies being utilized. Additional fridges, freezers and ice maker are housed on the aft deck, allowing easy access to crew and guests without having to enter the air-conditioned saloon/galley area. The control station and the deck gear winches are housed on the flybridge. This provides uninterrupted views of the mast and sails,allows localized operation of the winches and the lines,and ensures unrestricted visibility for docking. Access to the foredeck is greatly improved by utilization of a raised bulwark which runs from stem to stern.Safety rails are located on top of the bulwark, thereby allowing safer acess to the fore deck during inclement weather. The fore deck is uncluttered and affords safe and easy access to the built in seating, the crews quarters, trampoline, mast, anchor locker, windlass and sail lockers.